Tenant or Squatter? The Battle Over Tribeca Apartment on Leonard St.
They’re fighting over the most fragile building in Tribeca. For the past four months, Ron Rivellini, a freelance store designer and art dealer, has been waging a legal battle for what he says is his home, the second floor of a decrepit three-story, 157-year-old building that stands—barely—at 17 Leonard St., amid multi-million-dollar Tribeca lofts. Last December the Buildings Department found the structure to be in perilous condition, with multiple widening cracks, a dislodged post that supports the beam above the entrance, and the “bow-out” of a wall among its many structural problems. It cited the owner, Christopher Rolf, 61, for failing to maintain the building’s exterior and issued a vacate order. That forced out Rivellini, the only one living there, and prompted him to sue Rolf to make the building habitable so that he could return. Hearings on the case, which began in June, continue this month. While Rivellini, 43, wants Rolf to repair the cracks, restore electrical and water service, and correct violations, Rolf claims that Rivellini never lived there legally in the first place. And besides, he says, the building’s unsafe conditions were caused by construction of the nine-story building next door at 15 Leonard St. It is the developer, Steven Schnall, he maintains, who should pay to fix them. Schnall denies Rolf’s claims and that dispute has been ongoing for well over a year. In the meantime, 17 Leonard Street, built as a stable in 1856, remains in a sad, deteriorating state, its brick walls cracked so wide in some places that light streams through. One window is open and another broken, leaving the interior exposed to the elements. 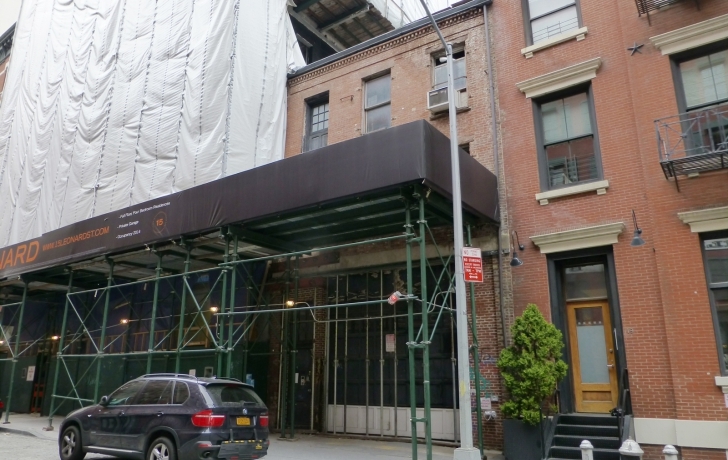 Early this year the Landmarks Preservation Com­mission issued a permit for shoring and bracing in order to “temporarily” stabilize the building. Just when the vacate order can be lifted is another matter. And it will be up to the Housing Court judge, Sabrina Kraus, to determine whether Rivellini has the right, as he claims, to live there once it does. Rolf could have plenty to lose. The building, which has IMD (interim multiple dwelling) status with the city, was on the market for $15.7 million when it was vacated. Rivellini said he both moved into the building and expanded into the larger space with Rolf’s permission. Rivellini also says he took occupancy of part of the first floor in March 2012, under an agreement in which he was paid for doing maintenance work related to the building’s stalled legalization process. At that time he said he considered the front part of the second floor to be his home. Rolf, who is bedridden from a February 2012 car accident and testified via closed circuit television, contended that he had never heard from Rivellini until September 2012––six months after Rivellini said that he moved there. During that conversation, he said, Rivellini agreed to use the space only to run an art business and complete the tasks Rolf assigned him while he was living with his mother in New Jersey and looking for an apartment in Manhattan. But Rivellini insisted that he only visited the New Jersey home occasionally, for no more than two days at a time, to care for his mother, who is 73. Then there was the matter of rent—at least that is what Rivellini called it. Each month, he paid $1,200 to Rolf’s grown son Anderson, with the understanding, he said, that it would be passed on to the father. Rolf referred to the money as a complicated arrangement for indirectly providing support to his son. “Why did he write that?” Rivellini’s lawyer, David Frazer, asked Rolf. In a heated exchange, Frazer pressed Rolf to explain why, in November 2012, he instructed Rivellini to call himself a “houseguest” when speaking to an attorney representing his sons in the dispute with 15 Leonard Street. “Why didn’t you use the word superintendent?” Frazer asked. Frazer pushed further, asking if “property manager” or “employee” would have been appropriate terms for Rivellini’s position with the building. “The problem is, he’s kind of in between all those things,” Rolf replied. “Was he also like a houseguest, who also stayed at the loft?” Frazer countered. “He did not, to my knowledge, stay at the loft,” the landlord replied.